Whenever you delete a file in any of previous Windows version, you are asked by Windows to confirm if you really want to delete that file. However Microsoft decided to disable this feature in Windows 8&8.1 and from now on whenever you delete a file or folder it will immediately be moved into trash. But with small change inside options you can return it back in Windows 8 and avoid accidental file or folder removal. 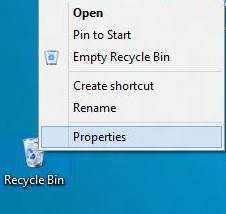 Step 1: Right mouse click on Recycle Bin located on your desktop. Step 2: From context menu that appears choose Properties. Step 3: In window that opens up select check box in front of Display delete confirmation dialog. 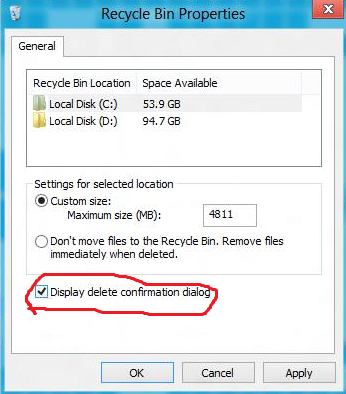 Step 5: Next time when you delete certain file or folder in Windows 8&8.1 you will get a confirmation window before that file is deleted, giving you the option to choose: Yes or No.